Ah, curry. It’s the sometimes mysterious, often spicy, and always comforting dish native to many many cultures. It comes in green, orange, red, and every color in between; a combination of spices and flavors that’s difficult to discern. It’s not just curry powder that makes this dish so special, but the hours spent simmering and bubbling as who-knows-what sneaks its way into every crevice and aperture of whatever exotic vegetables are graced with its presence. It’s the indescribable combination of this powder and that pepper that somehow creates a similar, although entirely unique, flavor. It’s the fragrance of cumin, coconut, exotic pepper, and so on that makes you swoon the moment it comes into contact with your nostrils, which are pining desperately for another whiff. It’s best enjoyed in dingy restaurants where you wouldn’t dare try to pronounce its name. “I’ll have the Pra-.” The waitress finishes your sentence, though you have no idea what she just said. It’s a blind draw, most of the time, though what lands in front of you is worth the risk. Whatever kind of curry it is, it’ll likely make your nose run and make you empty your water glass over and over again. Your only reprise is the moist rice, which gives you a break from it all, but also serves as the perfect vehicle for soaking up the last drops of curry sauce, once the potatoes, meat, and the myriad vegetables beyond recognition have been consumed. Let it be known, this is not that kind of curry. This is the kind of curry made by people like myself, whose pantries are not stocked with whatever insanity goes into the real stuff but sometimes, in the comfort of their own PJs, crave the styling’s of non-descript Thai restaurants. Order in? Not on my watch! This is not to say that this curry is no good. In fact, it’s very very good and very very easy. You’re in for a creamy and smooth texture made rich with coconut milk and the spices of my favorite trader, Joe. 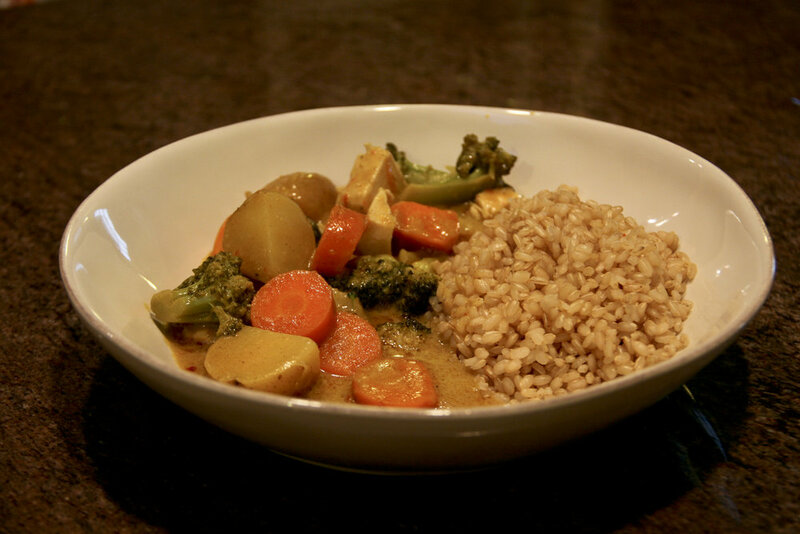 You can use whatever veggies you like, but I found the combination of waxy potatoes, bright carrots, and bristly broccoli create the perfect trifecta of flavors and textures to soak up the mouthwatering curry. This dish takes about thirty minutes, which is no small feat in the world of curry curation. In so many words, this dish is simple, easy, delicious, and reminiscent of (but not identical to) late nights in Thai Town and early mornings with leftovers. And, made entirely with Trader Joe’s ingredients, it’s a perfectly affordable recipe that won’t send you to the ends of the earth to track down rare and exotic ingredients. You can “Khorb Khun Ka” me later. 1. Bring a medium size pot of water to a boil. Add potatoes. Cook for 5-8 minutes, until potatoes are just tender. Remove, and slice into quarters. 2. In a large pot, bring coconut milk and curry to a boil. Add potatoes and carrots and turn heat down to a simmer. 3. Simmer for about 5 minutes. Then add in broccoli, chicken, and chili paste. 4. Stir and simmer until vegetables are the desired tenderness and add more chili to taste.